Welcome Back Spring! I’ve Missed You! 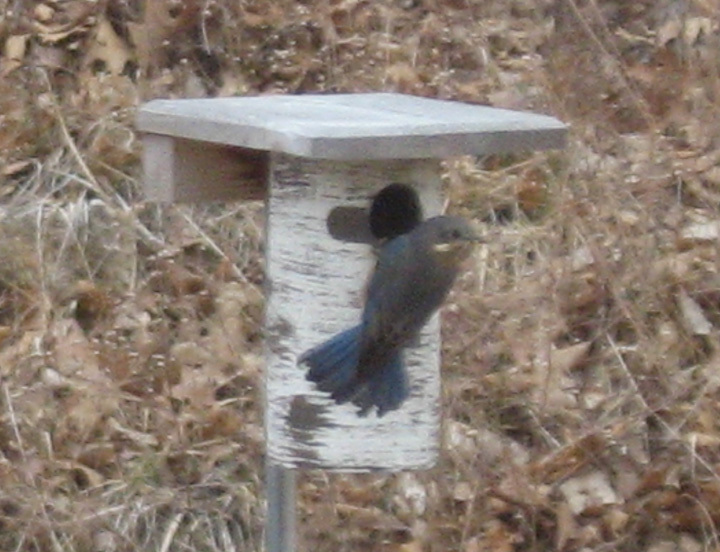 A female Eastern Bluebird brings nesting material to the nest box. After the winter we’ve had this year, I don’t think there are many people in the United States who aren’t relieved that Spring has finally arrived! Terms like “polar vortex” and “arctic blast” were heard way too frequently in the local forecasts. My poor furnace ran for days non-stop and still couldn’t keep up because of the frigid, sub-zero temperatures outside! But here it is! It’s finally arrived…SPRING! It promises of new beginnings, when the earth wakes up after its long winter slumber! And today, being the first official day of Spring, is a perfect day for me to write my first post in this blog! Here in Missouri, in the very heart of the nation, the cold is slowly giving way to warmer days. I heard my first Spring Peeper (a tiny treefrog) of the season singing by my pond about a week ago, and several more have since joined him. The bluebirds are nesting! The female has been hard at work all day dragging nesting material into the nest box in my yard. (I’ll try to keep up with their progress and share it with you.) The woodpeckers are drumming to establish their territories, robins are busy plucking up insects that are emerging from their winter beds, and an Eastern towhee passed through a couple of days ago on his trek north. There’s a lot of activity going on! The plants are waking up as well. I can see the first bits of my rhubarb poking through the mulch. My young dogwood tree is budding out, but whether it’s leaf buds or flower buds I’m not really sure. I’m hoping that this will be the year it will finally bloom for the first time. My tiny red buckeye that I planted last year did indeed survive the winter and I can’t wait to see how far it progresses! Still with some of my plants, I’m not able to tell yet if they survived or not. I’m going to have to wait and see. I may have to start over or reevaluate if that plant was actually suitable for that spot. This entry was posted in YARDVILLE Happenings and tagged birds, bluebird, buckeye, dogwood, Eastern Bluebird, frogs, garden, landscape, nature, plants, spring, Spring Peeper, towhee, trees by Angela Ewing. Bookmark the permalink. Angela, this looks like a really nice piece of work. This is really neat, Angela.